Century Cycles Blog: Katie Spotz rides again! We are incredibly honored to have helped Katie Spotz get back on a bike this past week. And we're incredibly stoked to know she almost immediately named the bike "Phoenix." In late August of 2010, the Cleveland cycling community was disheartened to learn that Katie Spotz, the Mentor, Ohio native who has become an international celebrity for her athletic and philanthropic achievements, was the victim of a robbery. Katie's 2000 Dodge minivan was stolen from a Cleveland parking lot. The van was recovered by police a week later, but the loss of the contents was even greater. Inside the van was her Giant OCR Composite 2 bicycle, which she purchased from Century Cycles back in 2006 and used on a cross-country ride to honor her grandmother who had recently passed away, and raise awareness for lung disease. Also in the van were a custom made set of oars worth $2000, which Katie used in early 2010 for a record-setting solo row across the Atlantic Ocean to raise money and awareness for clean water projects around the world. When longtime Spotz supporters at the Chagrin Valley Rotary Club reached out to Century Cycles about doing something, Century Cycles owner Scott Cowan agreed to help and immediately contacted Giant Bicycles. 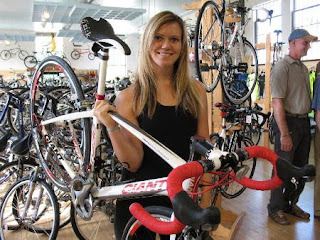 On September 15, she was presented with a brand-new 2011 Giant Defy Advanced 1, jointly donated to her by the Chagrin Valley Rotary Club, Century Cycles, and Giant Bicycles. Yesterday was truly a day I will never forget. You all have gone so far above and beyond in making me feel special. Every time I ride this bike, I will be reminded of how much you care for and support me. I cannot wait to get on the road again and do more adventures with it. Words cannot describe my sincerest gratitude for helping me put the pieces together again. As any cyclist would know, a bike means a lot. But more than a bike, knowing there are people like you looking out for me, truly means the world. Call me crazy, but I think I have a name for the bike. And it's Phoenix. And the meaning: A person or thing regarded as uniquely remarkable in some respect. Or, in classical mythology, a unique bird that lived for centuries and rose from ashes with renewed youth to live through another cycle. Cool, huh?